Who: Ricky Romero, No. 24. Left-handed starting pitcher. 6’0”, 215 LBS. 27 years old. Provenance: East Los Angeles, California. Drafted as out of Cal State Fullerton by the Blue Jays in the first round (6th overall) of the 2005 draft. Contract Status: Signed five-year $30.1 million extension with the Blue Jays in August of 2010. Deal runs from 2011 through 2015, and includes one club option for 2016 at $13.1 million. Career Stats: 3.60 ERA and 1.30 WHIP in 93 starts over three seasons with the Blue Jays. In 613.0 innings pitched, has struck out 493 batters (7.2 K/ 9), walked 241 (3.5 BB/9). 2011 Stats: 2.92 ERA, 1.14 WHIP, 178 strikeouts (7.1 K/9) and 80 walks in 225 innings. Looking Back: The most impressive aspect of Ricky Romero’s 2011 season is hard to locate in his stat lines or game logs. Certainly, the career best marks that he posted in ERA, WHIP, strikeouts and innings pitched show that RickRo took an important step forward last season in becoming a bona fide staff ace. But what sticks with us more than anything was Romero’s resolve in the final six weeks of the season. At that point, Romero was well beyond any innings pace that he’d ever previously posted, and his stuff and control began to elude him. There were times where early in counts, he just wasn’t locating pitches as well as he wanted. He went deep into counts, walked batters, gave up a few extra runs, ran up his pitch count, and got knocked out before reaching the seventh inning in a number of those games. But even with those struggles, Romero bore down and limited damage, pitching smartly and working his way out of jams with guile and smart pitch selection. People can define the term “ace” however they want. But for us, a pitcher’s ability to focus and work his way through and out of difficult situations while saving the bullpen and keeping his team in the game are truly the hallmarks of that role. And that’s precisely what Ricky Romero did for the Jays last year. Looking Forward: While there were a number of high water marks for Romero last year, his strikeout and walk rates have remained relatively similar over all three of his major league seasons. Which raises the question as to whether if there wasn’t some luck involved with last year’s ERA. Romero’s fielding-independent pitching stats insinuate that his output might not be all that it appeared, and if you are going to cling to those FIPs and xFIPs when dreaming up your happiest Brandon Morrow thoughts, then it probably makes sense to note that Romero posted an xFIP of 3.80 last season. That’s not a bad mark (21st in the American League, if you must know), but there’s enough of a gap in the wrong direction between it and Romero’s ERA to make you wonder if a slight slip back might be entirely predictable. Romero’s success will depend in part on the defense behind him, and while there are positions that look as though they are improved (centrefield and third base), there are others that might be slightly diminished (second base and left field). 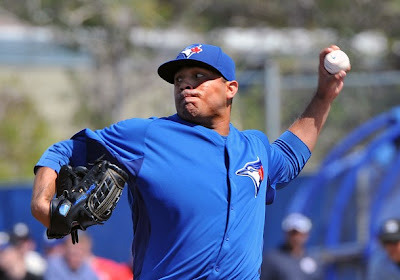 2012 Expectations: Even if he adds a half a run to his ERA in passing, it probably wouldn’t be a crushing blow to the Jays’ ultimate level of success. Romero’s ability to take the ball every five days and grind out more than 200 high quality innings will be the more vital contribution to the Blue Jays’ season.